Children make Father's Day gifts at school. 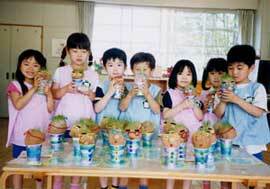 Photo from Tokushima Bunri University Kindergarten. Father’s Day is celebrated on the third Sunday of June. Father’s Day was created in the United States later than Mother’s Day and came to be celebrated in Japan in the 1950s. Department stores contributed to popularizing Father’s Day by holding “Father’s Day sales” as a marketing strategy. Though sending flowers on Father’s Day is not nearly as common as on Mother’s Day, roses are the most popular choice, in contrast to carnations for Mother’s Day. Father’s Day gifts vary greatly, including neckties, alcohol, favorite foods, or items related to a hobby.